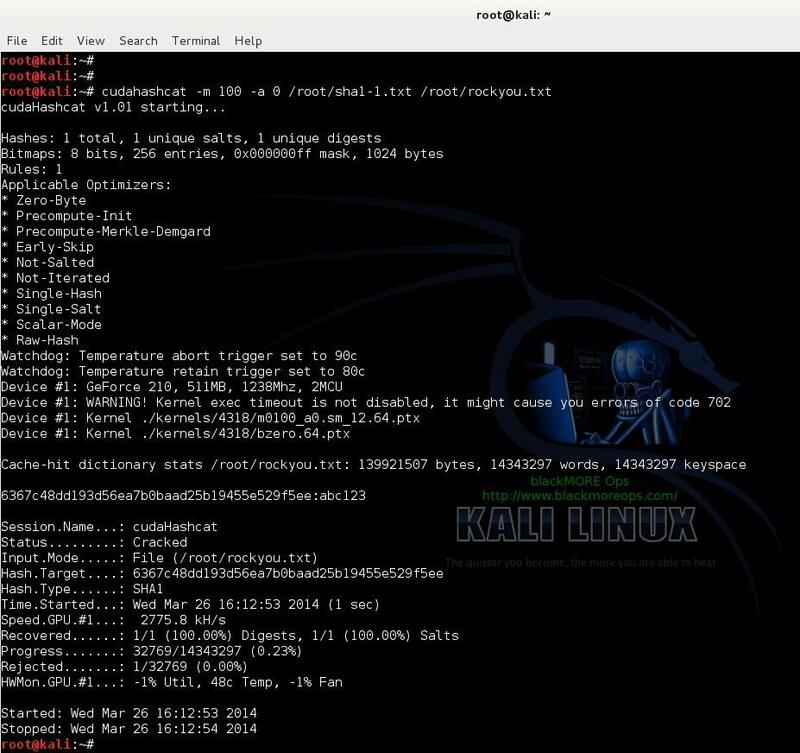 Cracking WPA WPA2 with Hashcat oclHashcat or cudaHashcat on Kali Linux (BruteForce MASK based attack on Wifi passwords) cudaHashcat or oclHashcat or Hashcat on Kali. 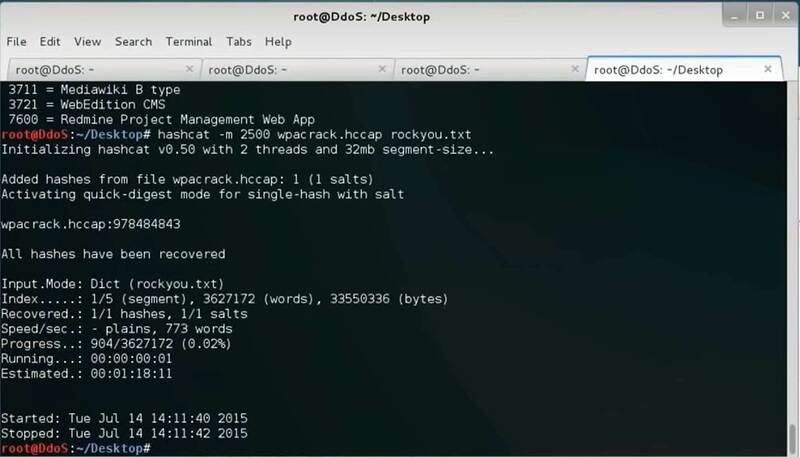 Instead of dictionary attack, learn Cracking WPA2 WPA with Hashcat. Hashcat, the popular password. 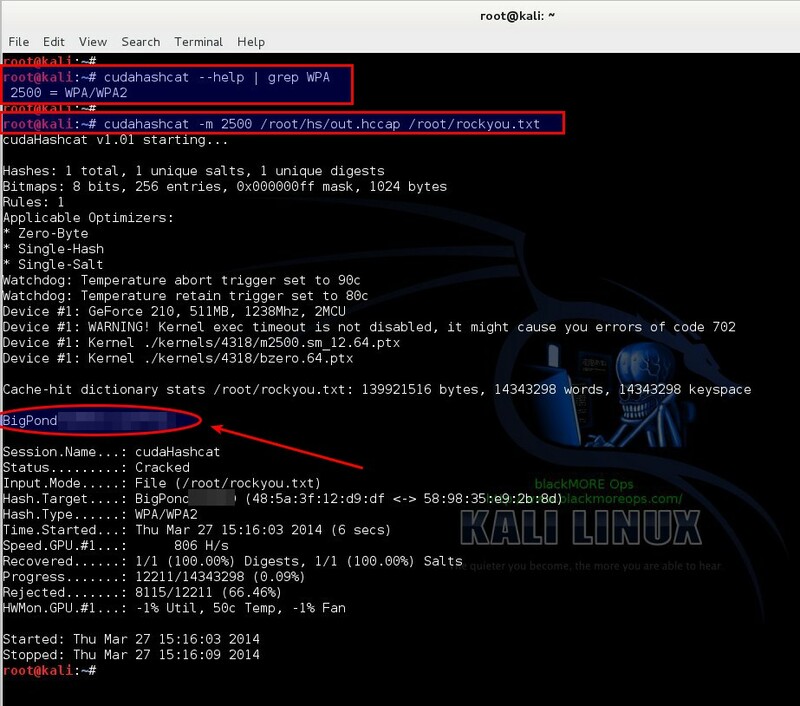 also enable their integration into popular Linux distributions.Wifi Password Cracked Using Hashcat Tool KALI LINUX. 2018-02-13. 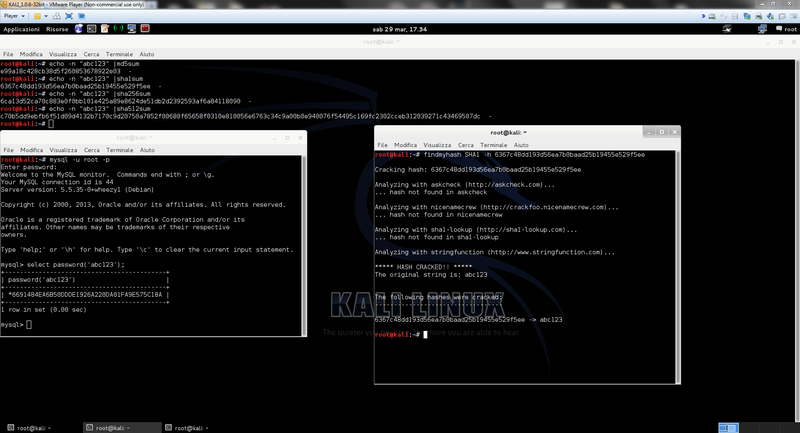 Breaking WPA2-PSK with Kali Linux. 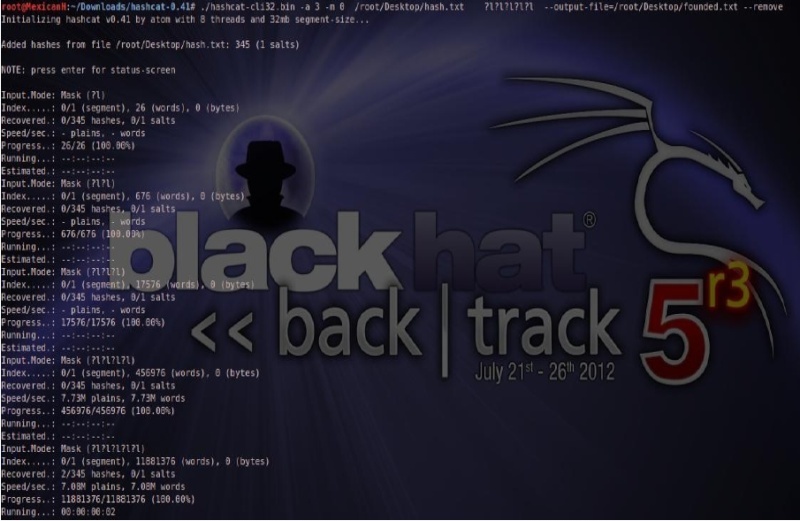 We will be using Kali Linux to complete this task. 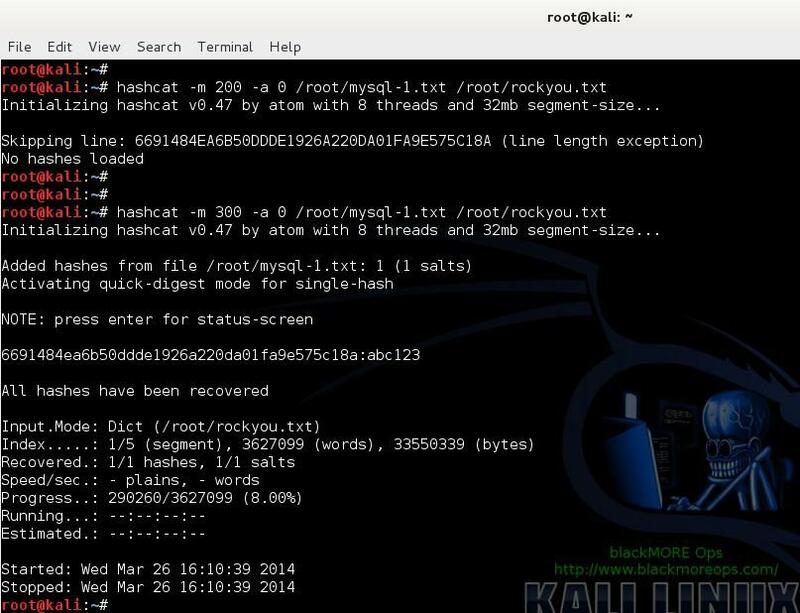 Crack Hash with Hashcat (Kali Linux) bruteforce (NO Password List) Tutorial. PixieWPS, Burp Suite, Hashcat,. 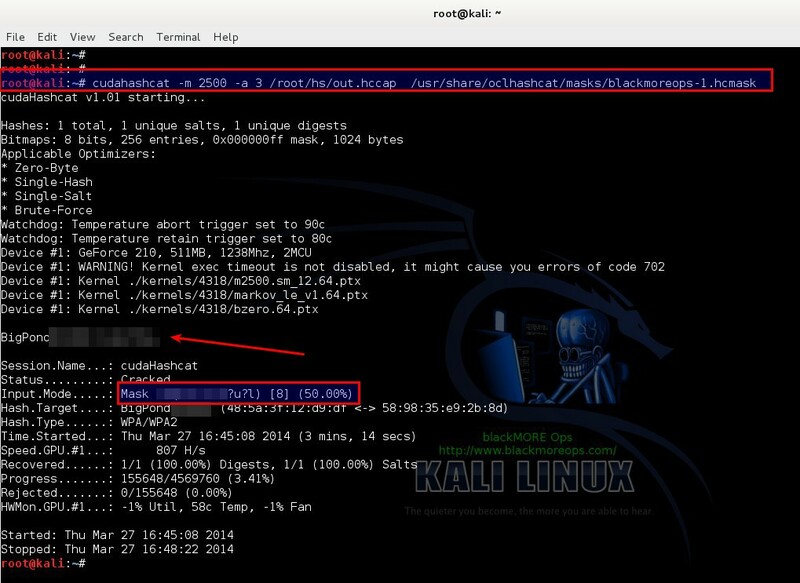 we encourage you to review the Kali Changelog. 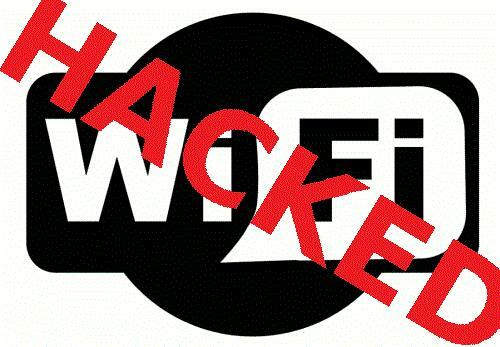 Cracking WiFi WPA WPA2 with Hashcat oclHashcat or cudaHashcat on Kali Linux (BruteForce MASK based attack on Wifi passwords) cudaHashcat or oclHashcat or Hashcat on. I recently went through an exercise trying to audit passwords in an Active Directory domain and found that quite a lot of the.The latest version of Kali Linux includes an outdated version of HashCat. How can I run hashcat using only the cpu in a virtual machine.Cracking WiFi WPA WPA2 with Hashcat oclHashcat or cudaHashcat on Kali Linux (BruteForce MASK based attack on Wifi passwords) cudaHashcat or oclHashcat or. This tutorial was setting up hashcat on linux OS and i gave a short usage intro about it:) Thank you. 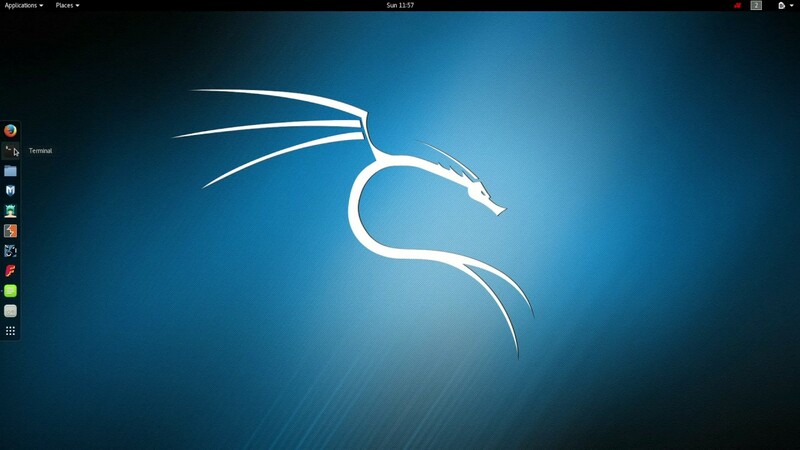 Information Gathering Using Kali Linux for Penetration Testing. 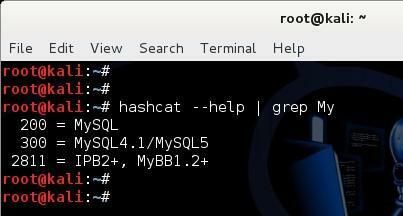 KALI LINUX - How to crack passwords using Hashcat 1st Edition Pdf Download Free - By Taylor Cook e-Books - smtebooks.us. 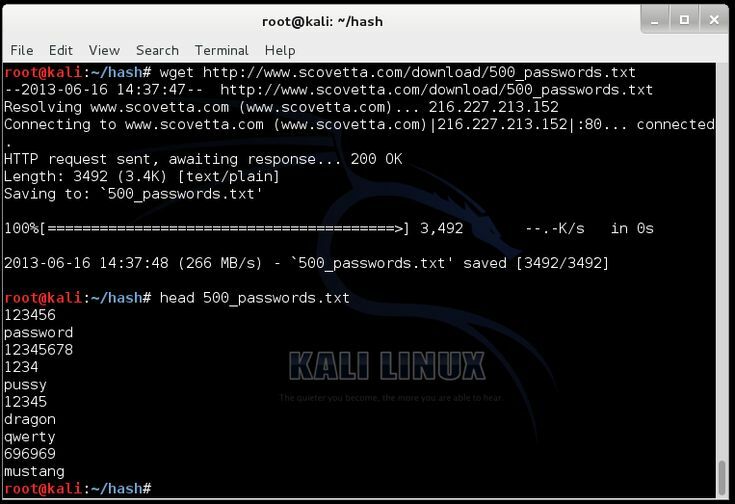 In this example we are going to use the default password list.Cracking Wordpress Password MD5 Hashes with hash-identifier and hashcat on Kali Linux. 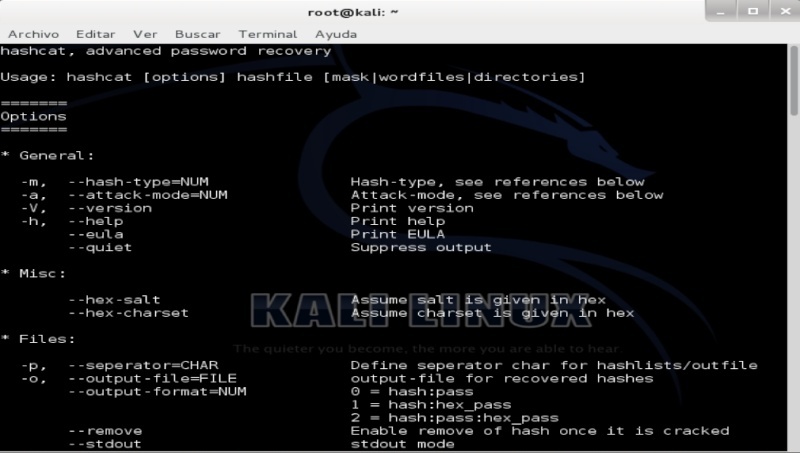 How to Create Wordlist with crunch in Kali Linux:- What is WordList.I have a desktop at home running windows 10 with 512 GB SSD and 4 TB HDD I decided to download Kali Linux on my system because I would like to learn penetration. The Intel SDK for OpenCL Applications is a comprehensive development environment for developing and optimizing OpenCL. 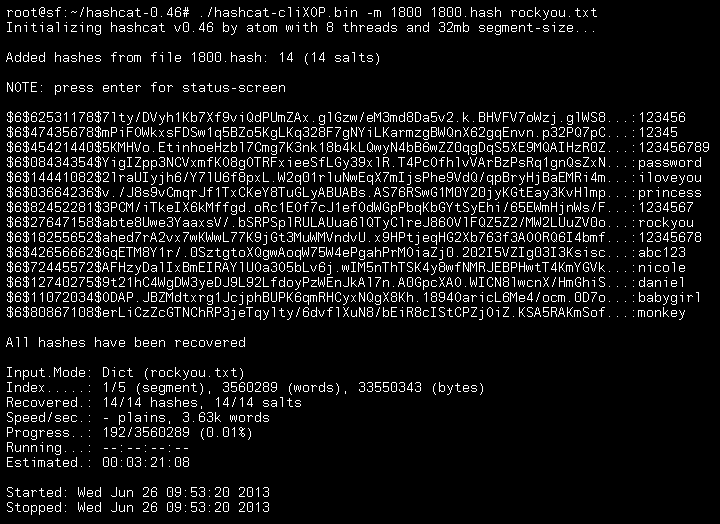 A guide to password cracking with Hashcat. 11. 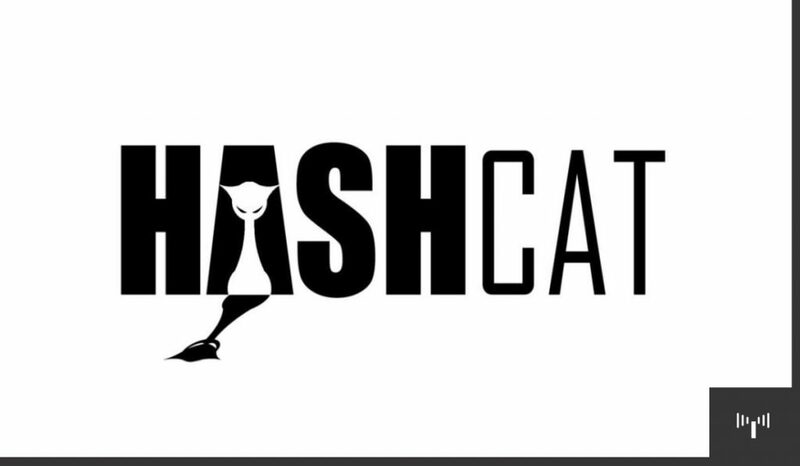 The latest version of Hashcat as of this writing is Hashcat 0.47. Using any modern Linux. 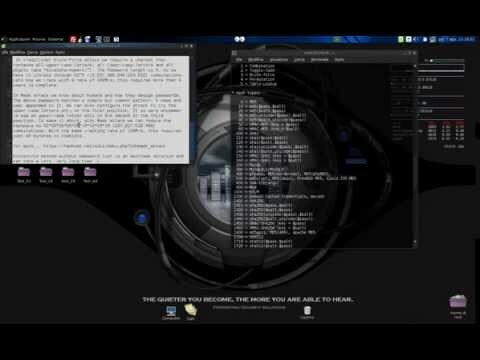 How To Decrypt Md5 Password Manually (Kali linux) MD5 decrypt Crack Hash with Hashcat (Kali Linux) bruteforce (NO. Kali Linux is an advanced penetration testing Linux distribution used for penetration testing, ethical hacking and network security assessments.Guide to retrieve your Windows 10 password hash and crack it, using Kali Linux, mimikatz and hashcat.